Two very closely matched motorcycles in terms of price but how do they compare on paper? 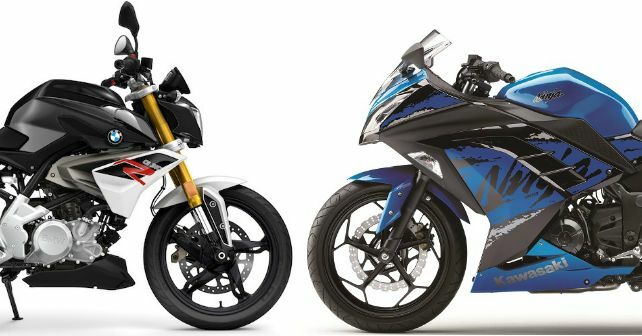 Both these motorcycles make more or less the same amount of power and torque – 33bhp for the G 310 R and 39bhp for the Ninja 300. At 28Nm and 27Nm respectively, torque outputs are similar too. But performance has got a lot to do with the weight too. The BMW is nearly 20 kilograms lighter than the Ninja 300, but the latter has also been fitted with a larger 17 litre tank. But the biggest difference between the two bikes is the number of cylinders that do duty on them. Although both motorcycles have identical displacements (313cc and 296cc respectively), the BMW houses a single-pot motor while the Ninja 300 packs a parallel-twin, and this is sure to have a considerable impact on the way they behave. Traditionally, parallel twins are known to be more refined than single cylinder motors and this comparison should be no different. Another major difference between the two motorcycles is in terms of ergonomics. Being a naked offering, the BMW has a relatively more upright and comfortable riding posture than the Ninja. The handle bar of the G 310 R is closer to the rider and the position of the foot pegs isn’t overly extreme either. This could essentially make long riding hours on the G 310 R a lot more comfortable than the Ninja 300. The Japanese offering is also slightly larger than the German in discussion. The Ninja 300 also has the advantage of being a fully-faired offering – and that is not just because a lot of buyers in India are fairing-fixated, but also because it is a lot more aerodynamic. As far as pillion comfort goes, the 310 R fitted with a single unit long seat is sure to be more comfortable than the Ninja 300. In terms of features both motorcycles are somewhat equally matched. The Ninja 300 gets a slight edge over the G 310 R mainly for the fact that it comes with a slip and assist clutch. The latter on the other hand gets upside down forks and an all-digital instrument cluster. That aside, both motorcycles come with ABS as standard. When speaking of features for motorcycles in this class, it is hard to leave the KTM 390 Duke out of the picture. The second-generation motorcycle comes with a large TFT display that connects to your smartphone to show call information and the likes. The Duke also gets ride-by-wire and a slipper clutch – both of which have a huge impact on the 390’s persona. But above all else, the 390 Duke is much more of a threat to the G 310 R than anything else in the market currently. A lot of it is down to the phenomenal value that a buyer gets with the KTM. The Austrian offering makes 42.9bhp and 37Nm – a more than 20 percent over the other two motorcycles make. And despite all that it offers, the 390 Duke is priced at Rs 2.40 lakh. BMW G 310 R & G 310 GS: What was BMW thinking?